We crossed the fantastic history path of The Säter Axe (Säteryxan) when Jonas found an old and rusty axe out by the cabin and started to restore it. The cabin is built back in 1803 for the Village Black Smith in Gottröra and this place have a inspiring history. You can see more about the restoration of the axe by clicking HERE. Below you'll find some general information about the Säter Axe. Please don't hesitate contacting us if you have any additional information that can help us gather correct information about the Säter Axe and it's history. The history of the Säter Axe Factory started in 1894 by Björshyttan 7 kilometers outside the town of Säter. In 1902 the company Säters Yxfabrik AB was founded by the businessman Mr Carl Rundqvist. In 1907 the production moved into a new facility inside Säter. Since the production was put down in 1966 the Säter Axe Factory building still stands on the same spot as a landmark of an fantastic era in axe history. You can see the beautiful building when passing on Road 70 trough Säter. Today it houses a cinema museum. After closing down in Sweden in 1966 the forge was bought by the Norwegian company Mustad who moved production to Norway, carrying on the Säter Banko, Säterpilen and Mustad Banko brands. In 1971 Mustad was bought by Øyo who continued the Säterpilen and Øyo Mustad Norway brand until 1974. After 1974 they consolidated the brand under the name Øyo Norway and are still offering axes and knives. Read more about Øyo's history starting 1860 by clicking HERE. When studying the Säter Axe product catalogs from the start up until the 60's you notice a number of classic patterns that stuck around. Often the denomination of the axes started with a model number followed by a hint of usage (for-instance Cleaving Axe or Carpenters Axe) finishing of with a geographical denomination (for-instance Umeå Model or Turpentine Model). Some axe model names was some-what exotic, probably to attract both Swedish and foreign customers. This as the Säter Axe also was well appreciated outside Sweden. 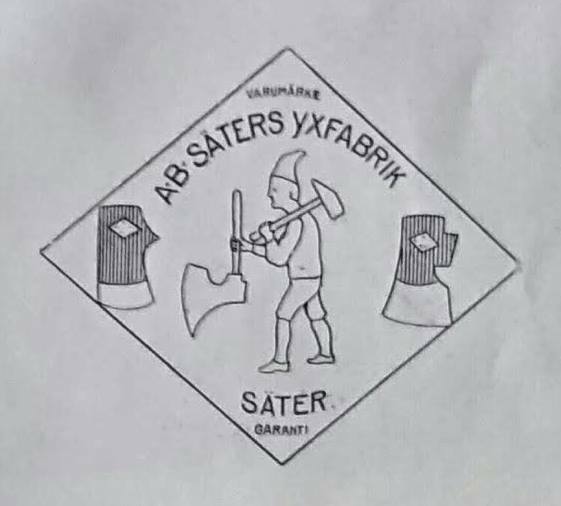 The Säter Axe have used a number of variations of stamps in the axe head over history. 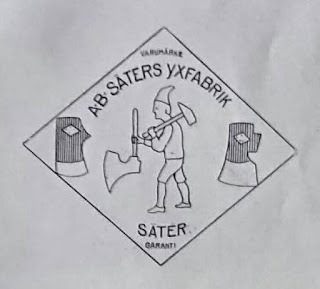 But generally can be said; until around 1920 the Axe Factory in Säter used a stamp showing a gnome holding a hammer and an axe. 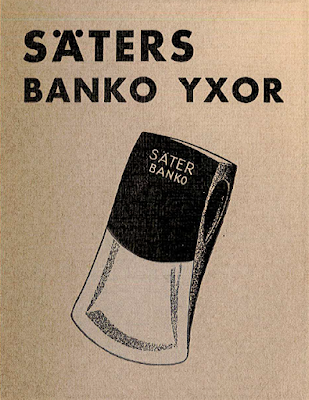 The stamped logo; Säter Banco (or Banko) started to be used during the 1920's and continued up until closing in 1966, even though the company also started to use a stamp showing a Moose and the two arrows of Säter. The word BANCO probably don't have any meaning, other than that is sounded good. A number of forges used the denomination BANCO during this era, for-instance the Igelfors Liesmedja. The forging of the Säter Axe was very interesting as they kept to the old and special technique of inserting (laminate) a hardened piece of steel at the edge of the axe; hold together by the softer iron of the axe head. A bit like the technique of the knife manufacture Morakniv at the time. Around 1960 the Säter Factory also shifted into full metal axe heads just as the rest of the Swedish axe manufactures had done long before them. One of the reasons for this was the lack of professional black smiths. The Technical Museum (Tekniska museet) made a thurow documentation of the axe factory the year after closing. And thanks to this we today have a lot of objects and documents preserved at the museum in Stockholm. By using the online service of the museum you can study some of the axes and photos from Säter. Take a look in the digital archive by clicking HERE. Our curiosity, love for history and old tools made the old Säter Axe that Jonas found out at the cabin the starting point of our life long project called; The Swedish Axe. The project has lead us to inspiring meetings with passionate people and interesting companies, all to gain knowledge of the high quality axes made in Sweden thought history and today. The project has so far produced a number of articles and a chance for us to spread knowledge about our axes to all our course attenders. We are grateful that the project The Swedish Axe has given us good connections at the big manufacturers; Hultafors, Gränsfors and Wetterlings, as well as good friends among the smaller Black Smiths of Sweden also producing beautiful axes but on a smaller scale. Regarding the Säter Axe; we are humble and grateful for all of your questions that have been sent to us trough the years. There are professional axe collectors out in the world as well as locals just found and old axe that have questions for us regarding their beloved Säter Axes. We must confess that sometimes we get a bad conscious for not being able to answer you all in time. But now we hope to have found a solution in publishing more about the Säter Axe here on the web site for you in the future. So keep coming with your questions and hopefully we'll be able to get back to you sooner, perhaps not with long mails but, with an interesting link to information about the Säter Axe here on the website. So stay tuned. Thanks for constantly supporting us in spreading the heritage of the Säter Axe by caring for your tools and stay safe when chopping wood. And if you have any stories, axes or documents you would like to share with us; you are more than welcome. We want to send a special Thanks to Mr Chris Hinchcliffe at the Tekniska museet in Stockholm for his input to the text above. Take a look at our courses on edge tools, click HERE. To see one of the articles about The Swedish Axe; click HERE. 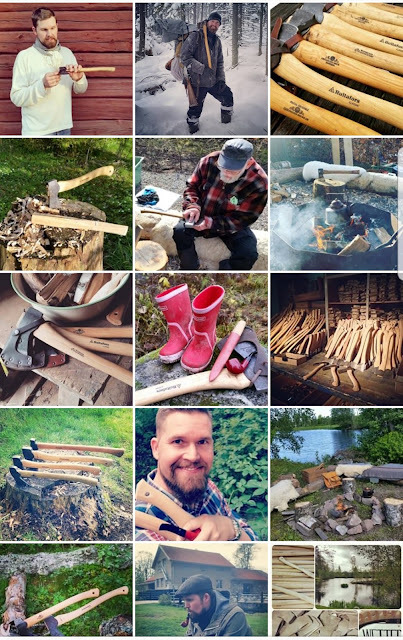 Welcome to follow the Swedish Axe project via Instagram and the hashtag #theswedishaxe.